In the 1800's, American proof coins were minted primarily as gifts for kings and foreign dignitaries. In later years, fortunate U.S. congressmen and senators were also bestowed with these exceptional gifts. President Andrew Jackson’s 1836 gift of a U.S. proof coin set to the King of Siam is a numismatic legend. The first U.S. envoy to the Far East, Edmund Roberts, took the coin set with him on a voyage aboard the USS Peacock in 1835 and arrived in Siam in the spring of 1836. Roberts presented the coin set to King Ph'ra Nang Klao (Rama III) of Siam in April 1836. The King's son, Rama IV, was the inspiration for the famous Broadway musical, "The King and I." For over a hundred years, this exceptional coin collection was unknown to numismatics around the world. It wasn't until 1962 that the set emerged in London. It is believed the King of Siam's son, Rama IV, gave the coin set to his British governess, Anna Leonowens, who died in 1915. It was their relationship that was the basis for the musical "The King and I." Over 120 years after the coins had been gifted to the King, two descendants of Leonownes sold the coins to a London, England dealer. The proof coin set included nine denominations ranging from half cent to eagle. The set was stored in a custom made case covered in yellow leather - the color of Siamese royalty. Inside the case, each coin was secured in a slot depressed into a lining of blue velvet. Its value is astounding. The King of Siam proof set sold in 2005 for $8.5 million. Previously, the set changed hands for over $4 million in 2001. Proof coins are the highest quality coins created by the United States Mint. Today, collectors highly value Proof gold U.S. coins and when they appear on the market they are quickly snapped up. Most proof coins have extremely low mintages. Some issues may emerge only once or twice every few decades. Blanchard recently acquired 9 awe-inspiring proof coins. The uniquely rare and valuable coins sold within a week. Many proof gold coins today are housed at the Smithsonian, or in the hands of a fortunate collectors. “American currency is a reflection and a record of our history,” noted Brent D. Glass, director of the Smithsonian’s National Museum of American History. Proof coins are the pinnacle of currency minted by our government. Because of their unbelievable beauty and rarity, discerning collectors covet gold proof coins as an extremely valuable part of their collections. 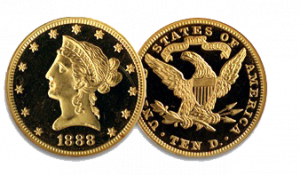 Proof gold coins are struck twice, resulting in a more defined and intricate result. The end result is that typically a proof coin of the same date will be more expensive, rare and valuable than a non-proof uncirculated. Proof – the term itself suggest superior condition of a coin. PR 70 is the highest grade possible for a proof coin and represents a perfect coin. Gem Proof (PF-65) – The surfaces are brilliant. There are no noticeable blemishes or flaws. Choice Proof (PF-63) No major flaws. The surface of the coin is reflective, with only a few blemishes. Proof (PF-63) The surface may be dull and have a few contact marks or hairlines. What's the difference between Proof and Mint? The United States Mint began producing Mint sets in 1947. These are uncirculated coins that are specially packaged, but have nowhere near the value of proof coins.